It all started with a piece of cardstock that I made into a holly leaf template. Once I had my holly leaf template, I traced it onto a piece of felt. I knew I wanted 5 burlap flags, with 2 holly leaves on each one. 10 leaves fit perfectly onto my felt. For my burlap banner flags, I used a cereal box to create my template. I then traced my banner flag template onto my burlap. The messy part is cutting all the burlap flags! I then laid my burlap down on a non stick surface. I used hot glue to glue down my holly leaves and the hot glue does go through the burlap a little. Just make sure it’s a surface that won’t get ruined. Once I glued down my leaves, I used 3 red pom poms as the holly berries and added those with hot glue too. I’m all about hot glue and no sew. That is why I used baker’s twine and my handy glue gun to hang the banner. I turned over all the flags and added a thin line of hot glue to the top of each flag. Then I pulled the twine tight and laid it down over the line of hot glue. You can use a straw or popsicle stick to press the twin down into the glue. Make sure and evenly space your flags along the twine as best you can. Now it’s ready to hang! I hung mine across my entryway at my front door. But this would be cute on a fireplace or above a table display. 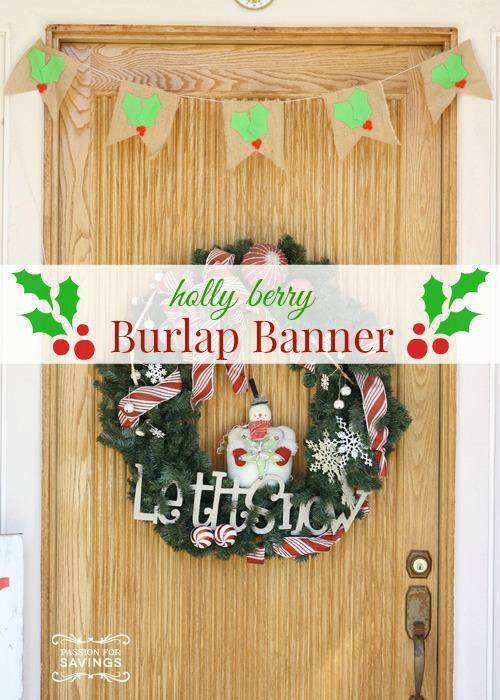 This holly berry burlap banner is bright and cheerful and totally perfect for the season. 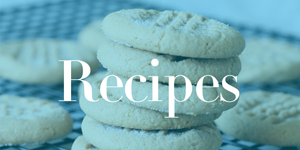 Chocolate Covered Krispie Treat Bites Recipe!